In this series of posts I’m gonna show you how to install PHP Frameworks such as “Laravel 4.2“, “Yii 2“, and “Zend Framework” on windows 8.1. Prerequisites: Make sure you have already installed latest WAMP Server. 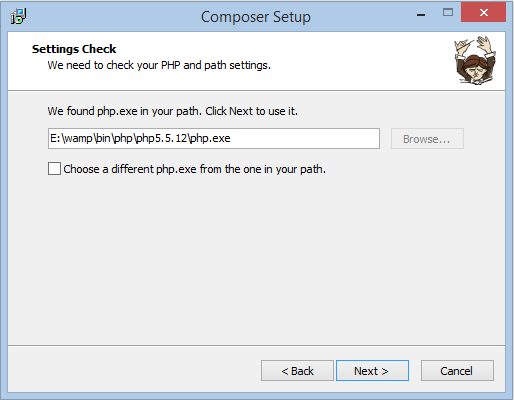 If you still haven’t installed WAMP server, don’t worry just read my post Installing PHP/MySQL on Windows 8.1 Using WAMP Server Step by Step. In this post you’ll learn where to get from and how to install Composer. 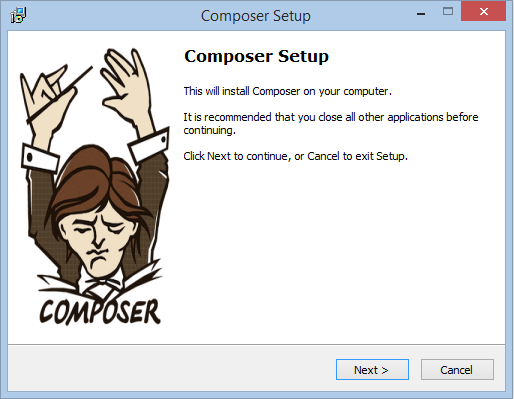 Just follow these 7 simple steps and you’ll get installed Composer in the end. 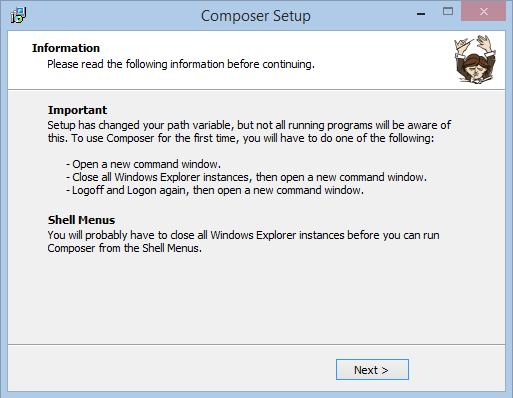 To directly download Composer-Setup.exe, click Download Composer Automatically. 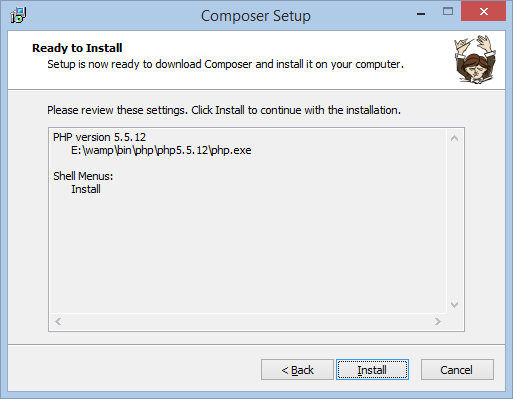 You can also download Composer manually by visiting www.getcomposer.org/…/installation-windows. Select “Install Shell Menus” option and click “Next >“. 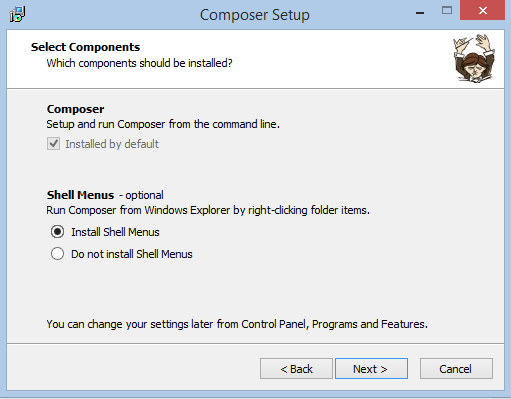 This option makes sure that after installation gets completed, you can run the composer anywhere just by right clicking and selecting the option “Composer Install“. Click “Browse…” and select the folder where your “php.exe” file exist. If you are not sure where to find it, don’t worry, just follow these given instructions. Click “Browse…” and you’ll see the windows ‘Open Dialog Box‘. Open the drive where you’ve installed WAMP Server. Open ‘wamp’ folder and look for the ‘bin‘ folder. Open ‘bin‘ folder and look for the ‘php‘ folder. Open ‘php5.5.12‘ folder and look for the ‘php.exe‘ file. Click ‘php.exe‘ file and then press the ‘Open‘ button. After all that, click “Next >“. Click “Install” to install Composer. You are being informed that the path variable has been changed, Log off and Log in again. Click “Finish” to complete the installation set up. Congrats! You’ve successfully installed Composer and have completed Part 1. I’m not sure what you are trying to do but it seems that you didn’t install the dependencies required to work. I would suggest you to run the "composer install" in the directory where your "composer.json" file exists for your project you are working on. You have installed composer which doesn’t mean you’ve installed your required pacakeges/libraries. This will install your package and will not throw error when you’ll use it. thanks for your reply !!!!!! Well first of all you’ll have to understand that why we use composer. There are some packages build by someone else and they allow others to use. These packages are maintained as collection https://packagist.org/.